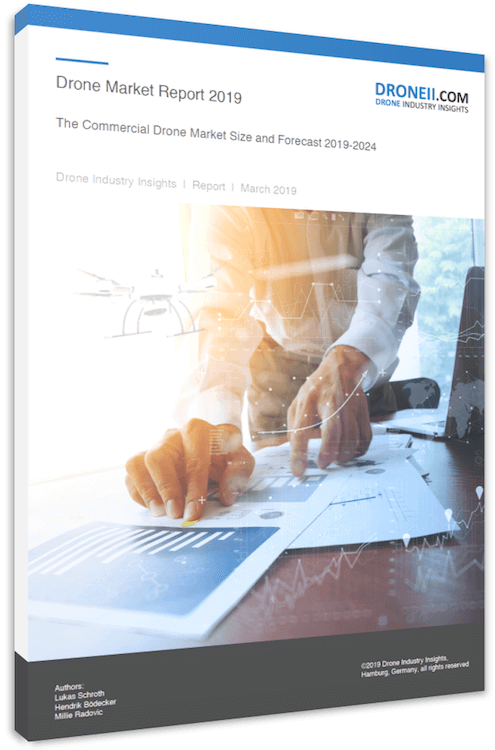 We expanded our drone manufacturer ranking to an industry company ranking to give a better insight and to show all current players in the commercial drone market. This extended ranking reveals components and system manufacturer as well as software-suppliers in addition to the drone-platforms. These companies represent significant players in the commercial drone market and require appropriate consideration in our ranking. The French drone maker Parrot (▷1) is still in the lead followed by DJI (△2) and Ghost-Drone manufacturer Ehang (▷3) with safe distance. New players in the TOP20 ranking are the four American software companies esri (6), SkyWard (9), Airware (17) and AGI (18) as well as the NIR (Near-Infra-Red) specialist Aegis (7), camera manufacturer FLIR (13) and the micro drone manufacturer Nixie (10). In this Excel-file you’ll find all information of the TOP50 commercial / private drone companies worldwide. This data is being updated quarterly to provide up-to-date information. How did we generate this data? It all depends on clicks and likes – This index gathers the online activity on several online search and social media tools. The highest scoring company in each dimension receives a rating of 100%, with all other Drone companies receiving a lower percentage in linear relation to the score of the highest ranking company. The total score is an average of all four measured dimensions. A company could become an index of 100% if he leads all considered sources. The autonomous swarming drone manufacturer collected 3 million Euros on the crowdfunding platform Kickstarter and with some delay they are ready to ship as per now. The tiny drone of the Torquing Group (a light weight of only 70gramm) even topped Hexo+, another popular drone project and at the time one of the most funded drones on Kickstarter ever. Yet another Kickstarter campaign, which raised almost $900,000 in LVL 1 from 1,500 backers and just another $22 million in Series B. This will fuel the commercial launch of the tethered Persistent Aerial Reconnaissance and Communications (PARC) vehicle. This UAV (like Facebooks “Aquila” or the Google owned “Titan Aerospace“) is a near-earth satellite system, which allows enormously long flight durations. Aeryon Labs is a provider of small Unmanned Aerial Systems (sUAS) for military, public safety and commercial operator worldwide and is now partnering with Microsoft on its new Microsoft Advanced Patrol Platform (MAPP) vehicle. Microsoft has chosen Aeryon’s SkyRanger UAV to demonstrate aerial image and data capture for MAPP. The Waterloo, Ont.-based Company has secured a $60 million investment from global growth equity firm, Summit Partners. With the holiday season ahead the Chinese Guangdong-based Company Syma Toys and Shenzhen Hubsan Intelligent Co.Ltd. are moving up along with the Christmas sales. Their products are very easy to use, start from $29,99 and made it onto the Amazon List of the hottest toys of the holidays. Started as another Kickstarter Project in July 2014 ($1.4M in Crowdfunding) Helico (HQ in Lativia) collected another $2.5M seed money in February this year. The result: the Airdog – a foldable drone designed for autonomous video shooting in action sports – is the CES 2015 Award winner (Best Drone or Robot of CES 2015). With an estimate of around $1M Revenue sales it seems are running rather well. With a variety of industrial, governmental and commercial utilization the German Company Microdrones works it’s way up into the TOP20. With many global contracts and an extended workbench called AVYON located in the US, production capabilities for Microdrones were increased according to the high demand. If you are you interested in the details of the TOP50 companies and their UAV solutions, feel free to download the TOP50 companies data sheet with more than 900 data entries and their industry sector as well as commercial focus. It is not surprising that Parrot and DJI are ranked at the top of the list. The is one of the top selling drones on the market. It has great capabilities and a very reasonable price and comes ready to fly. Dear Tom, Many thanks for your comment, but its not just the performance, Please consider that Parrot also has high influence on the commercial UAV market by the acquisition of the Switzerland sensefly and the funding investment for the French Delair-Tech. Both offer commercial fixed-wing platforms and present an alternate solution comparing to the recreational platforms of the Parrot company. Loved the article, Mr. Eaves. I have to say that I am very aware of the poetitnal benefits associated with domestic drones. But, as long as there is a looming threat of privacy compromise, I am not going to give any support to them. Now, if we develop, move forward and guarantee the safety of the people, I will definitely reconsider my stance. Understand though, I will not demonize drones in any way. They are machines. It is the poetitnal of human evil which makes me cautious. Best Regards,Tristan Cody. Yuneec Typhoon WiFi is out of date.